Wall, ceiling & bass trap acoustic panels for Cafes, Restaurants, Bars, School Classrooms, Gymnasiums, Halls, Home & Professional Studios and Offices. Providing superb sound control and cool looks at an unbeatable price. White polyester Acoustic panel - 1200mm x 600mm x 50mm, light weight, semi rigid and smart looks. Therefore ideally suited to both wall panels and particularly ceiling panels in cafes, bars, restaurants, schools, offices, studios and home theatres. This is our most popular panel for Schools and Cafes. White polyester Acoustic panel - 1200mm x 600mm x 50mm, light weight, semi rigid and smart looks. Designed specifically for ceilings in restaurants, cafes, bars, schools, offices, studios and home theatres where an extra classy, finished look is required. The beveled edges face down into the room giving a less bulky look but all the sound-absorbing advantages of a 50mm thick acoustic panel. Black polyester Acoustic panel. 1200mm x 600mm x 50mm, light weight, semi rigid and smart looks. Suitable for both walls and ceilings. Very popular on black cafe ceilings requiring a more casual "industrial" look. They look spectacular on natural wooden ceilings. Also popular where dirt is a problem e.g. kitchen areas. Panels are now available in 50mm depth Black Polyester with a 10mm clear Pine frame to give your room a very stylish appearance and extra absorption in the mid and bass frequencies. Panels are now available in 50mm depth White Polyester with a 10mm clear Pine frame to give your room a very stylish appearance and extra absorption in the mid and bass frequencies. Panels are 1200mm x 600mm x 50mm. Manufacture Bonded plastic fibre @ 35 Kgs per M3 density. Light, no irritation, eco friendly, washable, fade resistant, fireproof & 100% NZ building regulation compliant. Easily cut with sharp bread knife. Due to their very light weight and semi rigid design they are the only acoustic product that can be easily fixed to or hung from walls and ceilings without sagging or deformation. Sizes Ceiling & wall panels are w:600mm h:1200mm with square edges. Thickness Ceiling & wall panels are 50mm thick. Colours Black or White as shown above. Pack Size 4 Panels per pack. Fixing May be glued using contact adhesive (e.g. ADOS F2) or hung/suspended using anchors, and hooks. Full instructions and guidelines for fixing and placement are included in all packs. Application Ceilings and walls - 50mm panels. Coverage School Classrooms, Cafes, & Commercial (using 50mm thick suspended or direct glued ceiling panels) - approximately 36% of the total ceiling area for most school classrooms and commercial applications including restaurants, cafes, bars, offices and meeting rooms. Studio - placement is the key to successful recording and mixing studio acoustics. 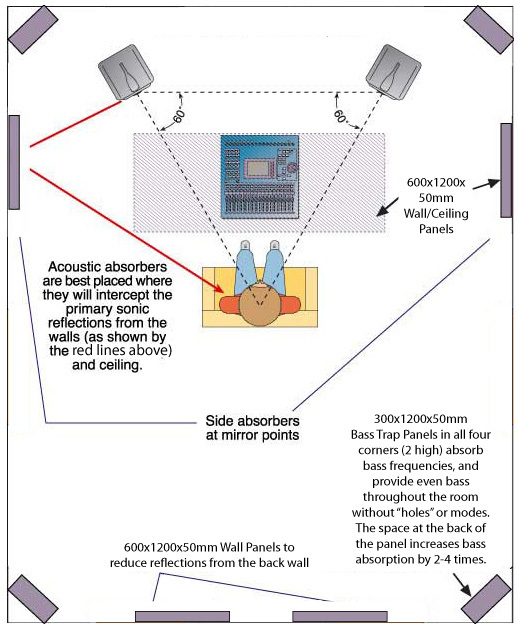 The three key areas are early reflection damping (primary sonic reflections), corner bass frequency trapping and rear wall behind mixing position damping. Please see diagram below. Home Theatre - similar requirements and placement to studios. The main difference is the side wall panel placement which is typically further back in the room mid way between the speakers and listening position. claimed and measured values download this PDF document. Weight 50mm ceiling and wall panels - 1.0kg. Send us your room measurements and snaps of your walls and ceilings and we'll send you back free recommendations for the quantity and positioning of your acoustic panels.